After a rather tiring week, Tantra woke up to a lazy Saturday morning. She switched on the TV and saw rather depressing news. Riots had broken out. The Ram Sena’s president had been beheaded. 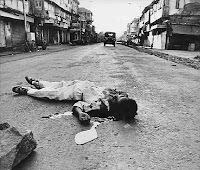 She lived in the heart of Pune, MG Road bang opposite to the slums where the ‘victim’ and the culprit lived. Apparently he was beheaded as he gave a speech demeaning the Muslims when he was invited to inaugurate an orphanage. Funny. She thought. She lived on the fifth floor. It was 11am. She could clearly see the events happening in the nearby slum from her balcony. The sun was venting out the anger too. A ray of lightning hit her face. A young guy had taken out a sword. Its shine took Tantra by surprise. The shine was blinding. She really wondered as to what would happen. She realized the fact that her weekend was effectively ruined. She came in and sat in front of the TV again. She quickly made some coffee, sat on her couch, cosying onto her cushions with all eyes on the TV. Someone knocked. She thought it would be the kids who normally come in to play her PS3. Tantra saw the chairman standing. I wouldn’t have opened it if I knew it was you. She thought. “Sure,” she replied and closed the door. She didn’t get the newspaper as all the delivery boys lived in the slums and they would have been really busy planning the riots. She heard a glass shield breakingand rushed to the balcomy. Tantra saw two groups fighting. Swords, fuel containers. Each group chanting out the names of their respective Gods. There were like a dozen vehicles in the galli. All ruined. To make her weekend even bloodier, she witnessed a guy ripping of the head of his ‘opponent.’ She was frozen. She hadn’t seen anything so bloodier after she had seen the charred bodies of her parents who died in the 1993 Bombay bomb blasts. Hence she moved out of Bombay after passing out her B.E. She chose Pune as she thought it to be more peaceful. This was one thing which she never expected to happen. She suddenly came back into reality and saw about seven dead bodies. All soaked in blood. She called up the police but all the calls were unanswered. Although no one picked up the phone, she could sense the shiver down their spines. Her galli was at the dead end and she could actually count 11 cars and seven scooters right up in flames. The rioting parties had done all of this for some anti-secular man who thought about speaking against a particular community in front of kids, who don’t even know who their parents are. Religion was a far off thing for them. All of this lasted for about 3 hours until the CRPF was deployed, well better late than never. After she understood that everything was under control, she ran outside the gate, onto the galli. “Eh ladki, kya chaalu hai, chalo andar jaao (Lady, what’s wrong, Get inside), orders from the top, we cannot allow anyone here as it’s a sensitive area,” a policeman yelled at her. “Listen mister, God has sent me down to ask you guys as to where had your battalion gone hitch hiking when people were being killed,” she yelled back. Is that the life of a riot or a bomb blast in India? Some anti-social creature talks some crap, some freak chops of his head and a bunch of so called followers bludgeon each other. Secularism, Security and everything is at stake. Let law takes it course. It will obviously take time but justice happens, well atleast sometimes. The elections are coming. Congress, BJP or some other juvenile parties. Politicians live, their supporters do not. Every political outfit in India has a history of rioting, be it the Congress who mastered one in Punjab or the BJP who did one in Gujarat. Let democracy live and not the politicians. Human blood it was. Blood had no religion. Bloods oozing out of the bodies of Hindu and Muslim rioters flowing right through the middle of the road, of the galli . Her blood also had the same smell. Just like an old saying. Chicken costs Rs. 100 per kg, mutton costs 200 and what about a human being.